Ann Hamilton Nagler, 94, of Edgewater, MD, died peacefully at home, surrounded by family, on March 17th of complications from a stroke. Nan had a passion for athletics and later, dog obedience training. She began playing competitive tennis as a teenager, something she continued into her seventies, and was a skilled figure skater in high school and college. Nan met her husband, Ken, at the University of Chicago where they were both pursuing master’s degrees. They married in 1947, and moved to Washington, DC where Ken began a thirty-year career with the U.S. Weather Service. Nan and Ken settled in Hyattsville, MD where they raised three daughters. 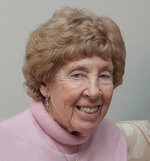 Nan continued her interest in athletics, teaching tennis and exercise classes. She taught swimming for more than thirty years at the Silver Spring YMCA including classes for many disabled children and adults. She was active in the PTA and was a Brownie and Girl Scout leader. In 1958, realizing that their Dalmatian, Sparky, needed training, Nan enrolled in a dog obedience class offered by what was to become the Canine Training Association (CTA). This began a lifelong passion she and Ken shared for raising and training dogs. They raised eleven litters of Dalmatians and two litters of Poodles. Nan competed in the early days of canine freestyle and went on to judge for the organization. Nan and Ken taught obedience classes for CTA and, over the years, they also worked with the Hyattsville Dog Training Club, the Washington Poodle Club, the Greater Washington Dalmatian Club, and the Rock Creek Kennel Club. Ann Blythe Hamilton was born June 1, 1923 in Chicago, IL to Elisabeth and George Hamilton. She attended Bryn Mawr college for a year and transferred to the University of Chicago. At Chicago she completed a B.S. degree in Chemistry and began work on a master’s degree in Microbiology. Before starting a family, Nan worked as a laboratory technician at Billings Hospital in Chicago and Georgetown University Hospital in Washington. She is survived by her husband of more than seventy years, Ken, three daughters, Betty Smith (Greg) of Winfield, IL, Janet Nagler of Silver Spring, MD, and Sue Beatty (Charlie) of Edgewater, MD, and two grandchildren, Paul Beatty of Annapolis, MD and Julia Beatty of Millersville, MD. She was preceded in death by her two sisters, Helen Bross and Kathie Smith. Her Poodles, Poppy and Willy, were also close to her heart. P.O. Box 900061, Raleigh, NC 27675 (www.akcchf.org). Online condolences and tributes may be made by using the link on this page. This obituary is protected by copyright by Kalas Funeral Home & Crematory. Proudly Serving the Communities of Arden on the Severn, Arnold, Brooklyn Park, Cape Saint Claire, Crofton, Crownsville, Deale, Edgewater, Ferndale, Fort Meade, Glen Burnie, Herald Harbor, Jessup, Lake Shore, Linthicum, Maryland City, Mayo, Odenton, Parole, Pasadena, Pumphrey, Riva, Riviera Beach, Severn, Severna Park, Shady Side, Beverly Beach, Hanover, Riverdale, Bristol, Harmans, Selby-on-the-bay, Churchton, Harundale, Sherwood Forest, Davidsonville, Harwood, South Gate, Fairhaven, Hillsmere shores, Sudley, Friendship, Jacobsville, Tracys Landing, Gambrills, Londontowne, Waysons Corner, Galesville, Lothian, West River, Germantown, Millersville, Winchester-on-the-Severn, Gibson Island, Orchard Beach, Woodland Beach, Green Haven, and Owensville. Kalas Funeral Home & Crematory is located in the state of Maryland, United States.